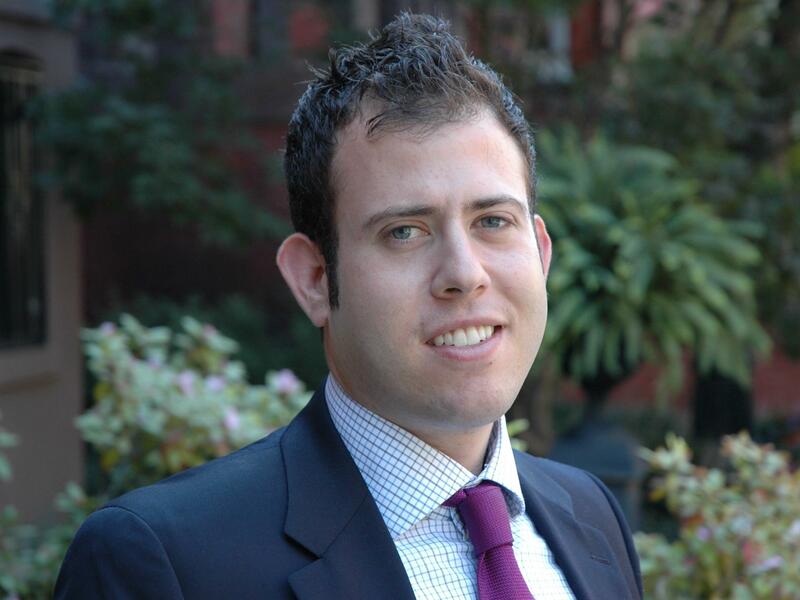 James Kirchick is a journalist and a visiting fellow at the Brookings Institution. He is also the author of The End Of Europe: Dictators, Demagogues And The Coming Dark Age. For over three years, Kirchick worked at The New Republic, where he reported on domestic politics, lobbying, intelligence, and American foreign policy. Kirchick is also a leading voice on American gay politics and a recipient of the National Lesbian and Gay Journalists Association Journalist of the Year Award. What is your sort of understanding of what freedom of speech entitles a person in a country like the United States to do? JAMES KIRCHICK: I think free speech prevents the government from preventing speech. RAZ: ...And nobody can arrest you. KIRCHICK: No, that's probably the greatest thing about this country. RAZ: This is James Kirchick. He's a visiting fellow at Brookings. And about 15 years ago, James was a student at Yale. KIRCHICK: I was a freshman at Yale in the spring of 2003. RAZ: In that semester, James was caught off guard when someone he strongly disagreed with was invited to speak on campus. KIRCHICK: The African-American Cultural Center on campus had invited a poet by the name of Amiri Baraka - who passed away several years ago. And he was notorious at the time for having published a poem called "Somebody Blew Up America." And in this poem that he had written, he alleged that the government of Israel had warned all Israelis in Manhattan not to go to work at the Twin Towers that day, and he was invited to basically read this poem at Yale. RAZ: To read that poem. AMIRI BARAKA: "Somebody Blew Up America" - they say it's some terrorist, some barbaric Arab in Afghanistan. KIRCHICK: And it was a fairly traumatic experience for me. And I, you know, grew up in a fairly well-to-do Boston suburb, had never experienced real anti-Semitism in my life before. And then to come to Yale as a freshman and see something like this happen was disturbing. And my instinct was not to, you know, shout Mr. Baraka down. I was a columnist for the Yale Daily News, the school newspaper, so I went to the event and I sat in the back of the room. BARAKA: Who knew the World Trade Center was going to get bombed, who told 4,000 Israeli workers at the Twin Towers to stay home that day. KIRCHICK: You know, that the poem has been read, I'm asking you a factual question. Do you actually believe that the government of Israel wasn't one thing or the other? He looked at me and he said in front of a room full of my peers, 200, 300 people, it looks like you have constipation of the face and you need a brain enema. And then everyone in the room laughed. So it was a really traumatic experience to witness this. RAZ: James Kirchick reflected on that experience from the TED stage. KIRCHICK: Now, I look back on this event because it played a major role in my maturation from a teenager into an adult. In my experience at Yale of confronting very difficult ideas and vexing personal situations has informed the way that I look at the debates that are raging across this country, and indeed the world, about freedom of speech. Freedom of speech is the most important right that we have as citizens in a liberal society. It is the freedom, the right upon which all other freedoms are contingent. And we are incredibly lucky to live in a country where we have something called the First Amendment. Only 13 percent of the world's population live in countries that protect freedom of speech. Now, I'm often asked as a Jewish person and a gay man how can you support the right of bigots and homophobes and anti-Semites to spew their hatred and their bigotry? To which I respond it is precisely because I'm these things that I think we have to defend the rights of everyone equally to be able to have free speech. RAZ: Let just sort of talk about this idea of speech for a moment. Why, in your view, you know, should these universities, should these campuses - like, why is the - this idea of allowing anybody to come speak so important? Why do students need to hear view points that may cause anxiety or trigger, you know, challenging emotions? KIRCHICK: Because that's life. I mean, we have a president who, you know, triggers challenging emotions among many of us on a daily basis. You can't avoid it. And you're not going to avoid it in your daily life. You're going to encounter people who disagree with you. And if going to college or university is about preparing you to be a good, able, capable citizen, which is how I think most institutions of higher learning advertise themselves, then learning how to deal with people who disagree with you civilly is a fundamental part of it. RAZ: I mean, universities are not required to allow anybody to speak, right? I mean, the First Amendment doesn't apply to a college campus, necessarily. KIRCHICK: I mean, obviously, there are - schools and universities are under no compulsion to invite certain people. But, look; do I think it's a good idea that college Republicans are inviting people like Milo Yiannopoulos and Ann Coulter to campuses? No. I think it's a bad idea because I think that there are better people to advance the conservative or Republican point of view than these two particular personalities. And I think we've entered this unfortunate period now where it's sort of a vicious circle where you have left-wing students getting upset and trying to shut down talks by these particular conservative speakers and then conservative students on campus sort of relishing and enjoying the victim status that comes with these sorts of spats and deliberately inviting people who they know are going to provoke this response. So I don't like what's happening on college campuses, but we should be clear where the fault lies. The fault lies with the people who are protesting - in some cases violently. KIRCHICK: A crucial concept that seems to be embraced by many people today is that words equal violence. Well, words are not sticks and stones. They may cause you distress, as they certainly have me, but they're not going to break your bones. And what's rather ironic about this is that often the people who make this claim, that words equal violence, are the ones who actually use real violence to shut down the speech of people with whom they disagree. Last year, the University of California at Berkeley had to spend $600,000 on security to protect a speaker coming to campus from a rampaging mob. Now, Yale, unfortunately, has not been immune to this intellectual discourse of censorship. A couple days before Halloween in 2015, the Yale Intercultural Affairs Council sent an email to the entire undergraduate student body in which it asked students not to wear costumes that, quote, "threaten our sense of community through the process of cultural appropriation." It then sent a helpful list of costumes to avoid. Now, feeling understandably somewhat patronized by this email, many students wrote to Nicholas and Erika Christakis, the master and associate master, respectively, of Silliman College. And Erika wrote an email back to her students. And she said, I wonder if we should reflect more transparently as a community on the consequences of an institution exercise of implied control over college students. Have we lost faith in young people's capacity, in your capacity, to ignore or reject things that trouble you? Well, that's when all hell broke loose. The following day, a group of students confronted Nicholas in the quad of Silliman College where they berated him over the course of several hours, screaming in his face, demanding that he apologize for the thought crimes of his wife. Then later, a group of students presented a list of demands to the president of Yale College insisting that Nicholas and Erika be fired. A common thread in these arguments in favor of censorship is that censorship helps the victims of discrimination. KIRCHICK: This is a double-edged sword that these people who are making this argument about power are making because once you limit free speech, there's no stopping the ways in which it will be limited. And free speech has actually been the greatest tool of people without power in this country, whether it was civil rights activists who used the right to assemble and speak to make their case, and they eventually made their case successfully to the American people, or whether it was gay activists. I mean, the gay rights movement, as we commonly understand it, started after police violated the association rights of gay people at the Stonewall bar in New York in 1969, and they fought back. So it's using the right of free speech that has allowed the powerless to actually achieve more power. RAZ: Do you think what's happening now on some university campuses in the U.S., and even in some other countries, is unique to this generation of students, or do you think that something else is going on? KIRCHICK: I think there is a fundamental difference. I graduated from Yale in 2006, and when I look back on the Halloween costume controversy and other controversies that are happening across campuses today, something snapped in the past couple years. There is a different notion of what freedom of speech means. If you look back at the last great student revolt in the United States, it was in the late 1960s, and you look at the Free Speech Movement at Berkeley, what was that about? It was about protecting the rights of, you know, left-wing anti-Vietnam War student protesters having the right to speak. They wanted to resist power. And they wanted to resist the governments in cahoots with their universities clamping down on their freedom. What are students now calling for? They want to collude with power. They want to collude with the administration and the government to shut down people with whom they disagree. It's the complete and utter opposite of the spirit that the student protesters in the '60s were fighting for. RAZ: What do you see as the downstream consequences of universities basically saying, we are not going to allow this speaker or that speaker or this speaker or that speaker? KIRCHICK: The downstream consequences of that - you actually have people who should be allowed to speak on college campuses. You're going to see them be banned because there's going to be someone who's going to get up and say, well, this person offends me. This person is a racist or this person is a fascist or a communist. It could be left or right. There's no end to it. There's this term that's - it's used all the time in these debates - slippery slope. But it's there for a reason because it's true. RAZ: You are not optimistic about this. KIRCHICK: Well, unless we have more university leadership, presidents and deans and administrators, being very clear in the way that, say, the University of Chicago has been in, you know, issuing a statement to all incoming freshmen, you know, there are no safe spaces here. There are no trigger warnings. You're going to be made uncomfortable by things that you hear. And, you know, the university is not going to come in and we're not going to comfort you. Unless we see more institutions taking that tack very early on, then I - no, I think we're going to have this drift into more and more forms of censorship, coddling, you know, once you open the door to this sort of thing. RAZ: James Kirchick is a visiting fellow at Brookings. You can see his full talk at ted.npr.org. EDWARD SHARPE AND THE MAGNETIC ZEROS: (Singing) What y'all call freedom, I can't call, no. What y'all call freedom, just a word, yeah. What y'all justice, I can't call, no. Uncomfortable - you got to get uncomfortable. Uncomfortable - you got to get uncomfortable. RAZ: Hey, thanks for listening to our show on the right to speak this week. If you want to find out more about who was on it, go to ted.npr.org. And to see hundreds more TED talks, check out ted.com or the TED app. Our production staff here at NPR includes Jeff Rogers, Sanaz Meshkinpour, Jinae West, Neva Grant, Rund Abdelfatah, Casey Herman, Rachel Faulkner and Diba Mohtasham, with help from Daniel Shukin and Lawrence Wu. Our intern is Megan Schellong. Our partners at TED are Chris Anderson, Colin Helms, Anna Phelan and Janet Lee. I'm Guy Raz, and you've been listening to ideas worth spreading right here on the TED Radio Hour from NPR. Transcript provided by NPR, Copyright NPR.